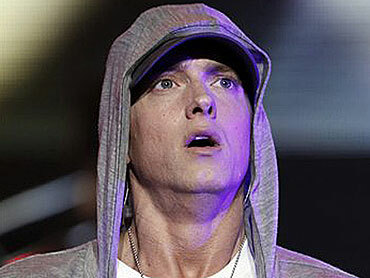 NEW YORK (CBS) Controversial rapper Eminem's new album "Recovery" has leaked on the Internet this week. The rapper's upcoming seventh album is not due out until June 22, but it looks like fans couldn't wait to have a listen as tunes from the set popped up all over the blogosphere. The unauthorized finds include the new "No Love" duet with fellow M.C. Lil Wayne and a collaboration with pop princess Rihanna on the brooding ballad "Love the Way You Lie." The leak of Eminem's latest offering comes less than a week after the online debut of the Pink collaboration of "Won't Back Down," according to MTV.com. The video for "Not Afraid," the album's official first single, was released Sunday, according to the report. "Recovery" was initally announced as Eminem's newest project by Interscope Records on March 5 of last year, originally bearing the title "Relapse 2." The album was slated to come out last year after the release of his last album "Relapse" in May 2009, but was pushed back to 2010.